St. Kitts, together with the neighboring Isle Nevis, is among the loveliest and unspoiled islands in the south Caribbean. It attracts many cruise visitors because of its scenic natural beauty as well as for its native culture and fine beaches. Discovered by Christopher Columbus in 1493, the original name of the island was St. Christopher, shortened more recently to Saint Kitts. The eco-friendly preservation of the island's natural geography is one of the reasons so many come here to relax and explore. However, the tourist trade is alive and well, with a myriad of souvenir shops, gift stores and some extremely fine dining establishments. Above all, however, Saint Kitts is truly a getaway destination, perfect for couples, honeymooners and those who really enjoy nature. Cruise lines make their port of call at Basseterre, the capital and largest community on the island. Just outside of the town a new, quite modern cruise dock has been constructed at Port Zante, and the terminal is complete with information desks, currency exchange booths and ATMs. Taxis can take visitors into the heart of the city in less than 15 minutes. However, some cruise travelers prefer to stroll along the waterfront to the central district of Basseterre. Port Zante itself has a number of newer shops and restaurants that have opened since the completion of this modern dock facility. Some of the earliest Colonial style architecture remains around the island, and there are a number of fine old structures worth investigating in Basseterre. Romney Manor was once owned by the grandson of Thomas Jefferson and today visitors can delight in its magnificent grounds and visit the Caribelle Batik shop, one of many such establishments that offer genuine batik clothing. The Nature Reserve contains a stunning display of flora and fauna, including the brown pouchless pelican. One of the most intriguing destinations on the island is the UNESCO World Heritage Site known as Brimstone Hill Fortress. 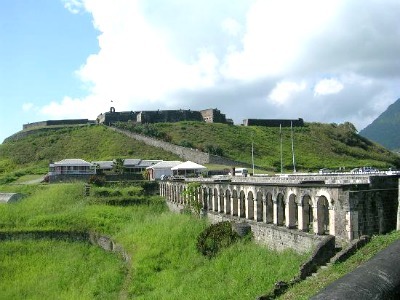 A 17th century British military barracks, this fortified complex was occupied by a huge number of troops during the period when fighting over control of Saint Kitts was at its height. 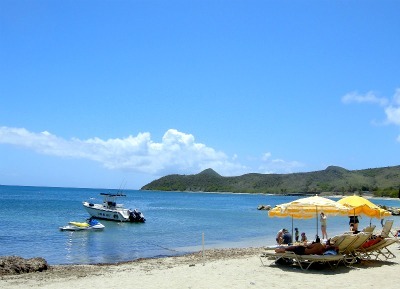 Among the delightful beaches, the Great Salt Pond is one of the most enjoyable. Here visitors can stroll between the Atlantic Ocean and the Caribbean Sea in just a few moments, as the beach is on a narrow peninsula. South Frigate Bay is a favorite for surfers and beachcombers, and waterskiing is popular along this entire stretch of coastline. For those wanting a bit of marine adventure, take a ferry ride to the neighboring Isle Nevis, which is more remote and ringed by coral reefs. The white sand beaches on this smaller island are exemplary. Mr. X's Shiggedy Shack serves the famous rum cocktail made with cane juice. At the Glimbara Guest House on Cayon Street the locals can be found whetting their appetite at the Glimbara Diner, a well-known establishment specializing in Creole style cuisine. 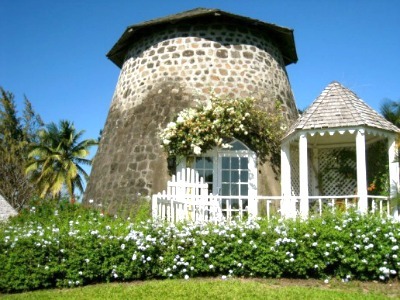 Outside of town and a short taxi ride from the center of Basseterre is the equally popular Rawlins Plantation. Here on the lower slopes of Mt. Liamuiga, diners experience the very finest in shrimp and lobster entrees. The excellent desserts are a mix of French and Caribbean cooking and the views are exceptional. Taxis are the preferred method of transportation for cruise visitors. The fares are determined by agreement and there are no metered fares. Taxis are plentiful at hotels, restaurants and along the waterfront as well as at the cruise terminal. Rental cars are available. However, you would need to purchase a visitor's permit in order to drive. The rural streets are crowded with pedestrian traffic as well as livestock such as goats and sheep. Driving slowly around the island is highly recommended. The local currency is the East Caribbean Dollar, although many of the gift shops and restaurants accept U.S. Dollar as well. The native language of the island is English, but the locals have created their own distinct accent, which can be a bit tricky to understand at first. Several of the cafes in downtown Basseterre have Internet access, especially those located in and around the central circus and at the TDL Mall on Fort Street. 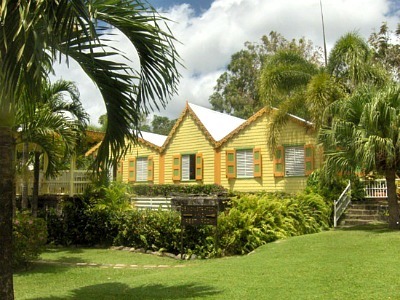 Romney Manor - one of the most popular places in St. Kitts among cruise travelers. Brimstone Hill Fortress - 17th century British military complex. People are having a great time at Great Salt Pond beach. 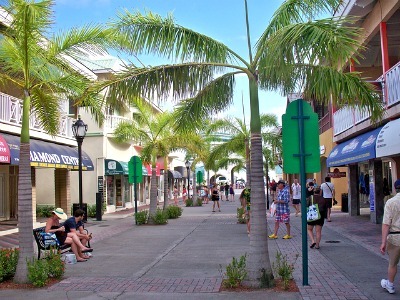 Basseterre has a lot of beautiful shops, cafes and restaurants. Rawlins Plantation is considered one of the best dining places on this island.